Interesting how life is.... Wonder where our On Off switch is.. and who is operating it!!! Calvin on sunday morning.. nothing beats it... :)Thanks gurl..
LOL !! That is funny! Wonder where our On Off switch is.. and who is operating it!!! so true. 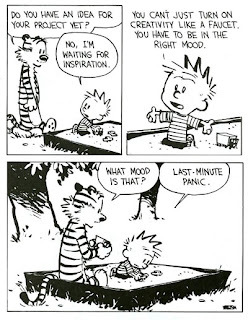 calvin capture our moods so well! take any cartoon u can relate to it! LOL! Absolutely right! ENjoyed your list of 'non boring' tasks like surfing the net and swatting flies. Coming to the latter, people talk of it as a lowly job, but do you know how difficult it is to swat a damn fly? Phew!! @ Apar : yeah yeah !!! You girls are doing this on purpose, I guess !! !